You know how sometimes you just want to disappear when something extaordinarily embarassing happens? On the face of it, it was not a capital offense. But did the engineer have to single me out? So, you’re approaching an elevator and the doors start closing. Folks have their different techniques but mine is the “elevator karate chop.” Just before the doors close you swing your arm up and down, sensors detect there’s some life form there and the doors open back up. Karate chops do not work on the Metro subway system. I had rushed down the escalator to catch the train and I had almost made it and the doors started closing. I tried to dart in. The doors closed on a bag I was holding in front of me. Some very nice guy tried to rescue me and the bag. After a few seconds that seemed considerably longer, the subway doors finally unleashed their grip, reopened and I got in. Ok- lesson learned. But , no. The subway driver gets on the intercom and says something to this effect—for the whole train to hear. “Yo. The guy in the green baseball cap, the blue jacket and blue jeans with the brown sneakers. 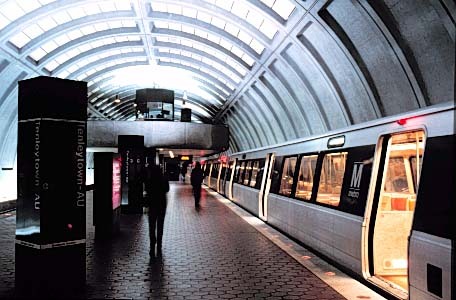 Metro doors do not work like elevator doors. There was another train coming in 4 minutes. You didn’t have to do that.” He might have said some other stuff, but by then, I’m going….wait a second…I meet this description. Holy Moly…he’s talking about me. People in the car are looking. I turned to an elderly African-American woman on the train and smiled my best charming smile. “Guess, I’m in trouble, huh?” She flashed a quick grin then promptly returned to the usual stone-faced “Metro-look” most people have on the subway. Does this officialy make me a Washingtonian again? LOL…Years ago, a friend of mine was on a crowded, rush-hour subway in NYC. Someone pulled the same stunt… the conductor proclaimed, “Fool in the Red Coat!” We still laugh about it! I just think if you hadn’t stopped to take that picture of the door beckoning you, you would’ve made it!